In addition to those tips plan ahead and set some ground rules for your pup and your guests. Dogs have these amazingly sad eyes that they use specifically for letting your guests know how much they would love anything on their plate. 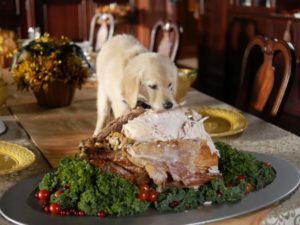 Obviously you never feed them so… If your dog is going to mingle with the guests it is best to set ground rules let your guests know not to feed your pup and explain what can happen. Aside from the mess you will have to clean up later there is also a chance that all those little table tidbits could cause a trip to the vet and some long term issues. Make an announcement before dinner keep it light but serious, especially if you have non dog people or elderly guests. One of my friends actually put up signs and had little table tents that said please do not feed the dog. She also had a t-shirt made that said do not feed the animals. Now this sounds extreme but the year before her pup was overfed by a few unnamed guests and ended up with a pretty serious case of pancreatitis It was scary and not cheap. Thankfully her pooch is doing ok but still has to be very careful about what she eats. 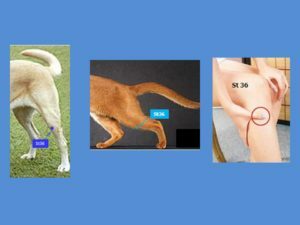 So enjoy the holidays in moderation and just in case you or your pup has a mild tummy upset I have attached just one point to use it is a good one and deals with constipation diarrhea and vomiting oh my… so just in case here you go.